You are at:Home»September»September 26»Today is National Pancake Day! Today, September 26th, we take a step back from the usual blood and guts bizarre history to celebrate something a bit more light-hearted (although not necessarily light on your stomach! 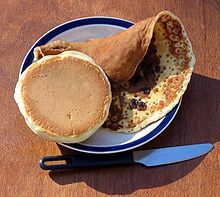 ): the flapjack, the hotcake, or what is perhaps best known as the pancake! The earliest known versions of pancakes go back to the Ancient Greeks in the fifth century B.C., although the word pancake does not appear in English until about the 1400s A.D.
Today, pancakes come in many varieties and we of course even have an International House of Pancakes (IHOP) chain dedicated specifically to the popular breakfast treat. IHOP currently has over 1,500 locations across the Americas and yes, also in the Middle East, employing some 32,000 workers. IHOP and similar chains around the world produce many unique versions of the delectable dish. In fact, just about every continent has its unique take on the flapjack from Africa to Asia to Europe to the Americas (not so sure about Antarctica, however). As for the holiday’s origins, as with the novelty gifts, the “official” beginnings of this holiday are once again rather murky. Websites first start mentioning it in 2000, while Elizabeth Crosby Stull references the holiday slightly earlier (in 1999) in her book Let’s Read! : A Complete Month-by-Month Activities Program for Beginning Readers. Of course, what is all the more fascinating is that September 26th is actually not the only day on which people celebrate the pancake. While September 26th is America’s pancake day, people in Australia, Canada, New Zealand, and the United Kingdom enjoy their pancake day on Shrove Tuesday in February. For those in the Commonwealth countries, Pancake Day has a long and storied history. In England, for example, they even have a pancake race dating back to the 1400s that is still run in the 2000s. But that’s enough of that. It’s time that we take a step back from the computer and enjoy us some pancakes! Question for students: How are you going to celebrate National Pancake Day? Yet, we reckon, you are probably most interested in knowing where to get the best pancakes on this important holiday? In most U.S. states, you need look no further than Perkins Restaurant and Bakery. If you happen to be in our nation’s capital, you may consider one of the places featured on this top ten list. We encourage you to recommend your personal favorite places for pancakes in the comments below! Albala, Ken. Pancake: A Global History (Edible). Reaktion Books, 2008. The featured image in this article, a photograph of pancakes and syrup at a pancake feed event taken by Dan Rohan on 24 March 2008, is a work of a U.S. Air Force Airman or employee, taken or made as part of that person’s official duties. As a work of the U.S. federal government, the image or file is in the public domain in the United States.